Shocking News: Fortune cookies are 100% Non-Chinese. It was the Americans! "WHAT!?!" - I know what you're thinking. Why would Americans invent such a thing? Why would anyone invent new food to convey a traditional feeling? So honestly, it's all the Japanese fault. They started it! Apparently the Japanese had a cookie that was slightly -just a little slightly- similar to the modern fortune cookie. When a few Japanese moved to the U.S. they brought the recipe with them and used it in their restaurants to appeal to the public - which worked. They also included little fortune slips that can be found in temples and shrines in Japan. That still leaves me in awe at the fact that it became a symbol of China. 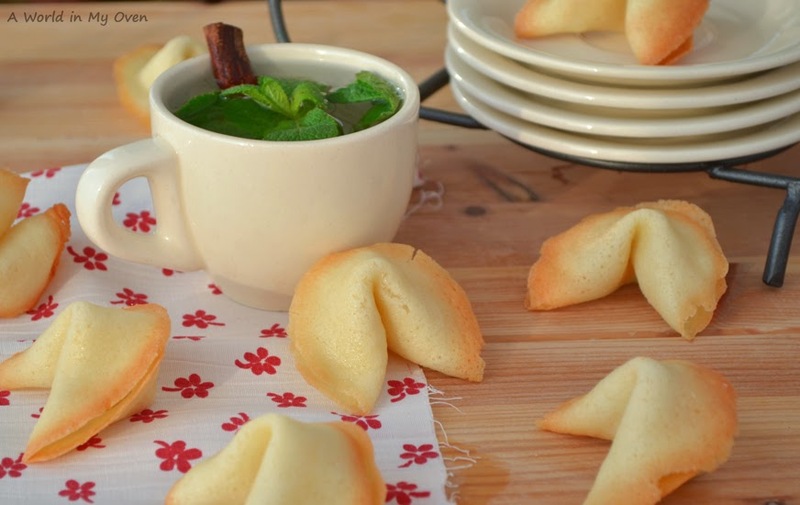 Although the history of fortune cookies is a bit vague - with so many laying claim to it's origins - and it seems to have been invented by the Japanese (/Americans), fortune cookies were mostly sold to Chinese restaurants. Since they were greeted with so much enthusiasm there, they became a symbol of the Chinese cuisine and China in general. 1. Whisk the egg whites with the vanilla and oil until it becomes frothy. 2. Sift the flour, starch, salt and sugar together. 3. Combine the wet and dry ingredients. Add water if you feel the batter is too thick. You should end up with a batter that is easy to spread onto a tin, but won't move around too much. Note you can always add a bit more water after the first cookies! 4. Pour a spoonful batter onto a lined or greased baking sheet and flatten it to make a large, thin circle. Try to make no more than 4, preferably 2, at a time. 6. At this point you need to work very quickly, as the cookies will cool down and become fragile very fast (which is why you want to do no more than 2-4). 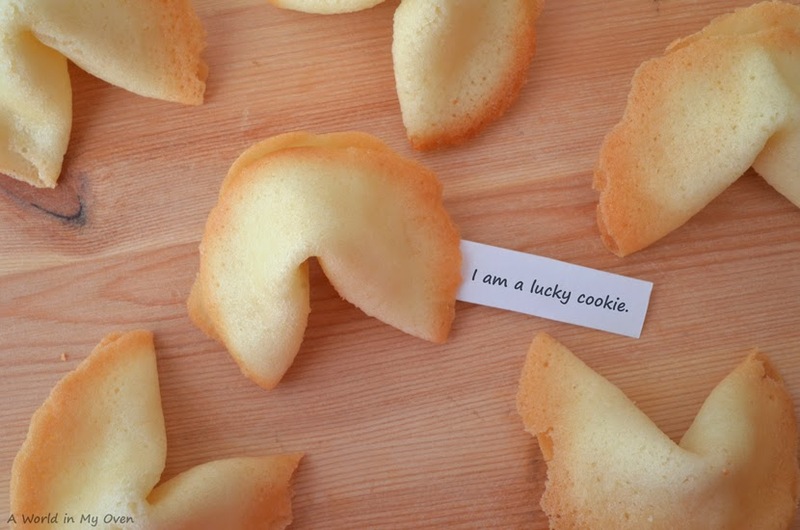 Take a cookie and place your fortune message in the middle. Fold the cookie in half. Then, pull the two corners of your semi-circle towards each other. Placing it over the edge of a cup might help to have the center fold inwards rather than to the sides. Now, you have your fortune cookie shape. Place it in a cupcake-tray, in a glass or in between 'heavy' objects to keep it in shape while it cools down. 7. Repeat step 4-6 until you finished all the batter. 8. Once all cookies have cooled down, they're ready to serve! Try to serve them as quickly as possible or keep them in airtight containers as they tend to get soggy fast. * A ice cream cone or waffle iron works just as well! - Not so lucky. For now. - Tomorrow is another day. 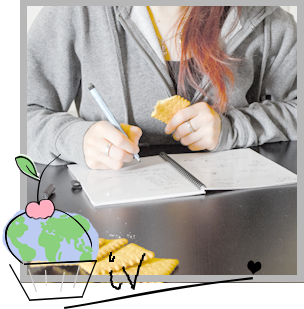 - Try a different cookie! - This is not the lucky cookie. - This is also not the lucky cookie. - YOU ARE LUCKY! YAY! This message was entirely Photoshopped though - I'll spare you my handwriting! Maybe I can help organise the catering? ;) You know I make good cookies!